See Photos of cabins & yurts below! Large Yurts: #2 and #5 The yurts are currently located in the Paul Dennis Campground. 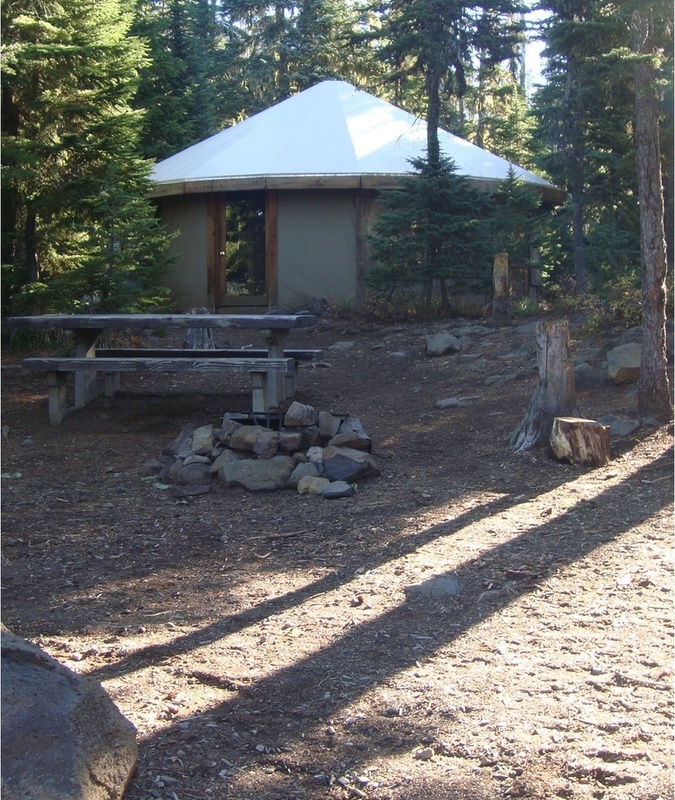 Each yurt has two bedrooms and a front living/kitchen area with chairs and a table. For sleeping, there are two queen size beds and one futon. There is no running water or electricity. Campfires are allowed in the yurt area. One small tent can be set up outside the yurt. Small Cabins: #1, #7 and #8 Each has one room, sleeps 3, includes 1 double bed and 1 single roll away bed. Medium Cabin: #4 One room, sleeps 4, includes 1 double bed and 1 single set of bunk beds. Medium Cabin: #9 One room, sleeps 4, includes 2 double beds. Large Cabins: #2, #3, #5, #6 and #10 Each sleeps 4 adults and 2 children. They include 2 queen beds and 2 single floor mattresses. All large cabins have a partition wall between the living room and sleeping area. Inside the Cabins: The Cabins include beds, dresser area with countertops and shelving, dining table and chairs, dish pan, tea kettle, water bucket, broom and dustpan, and a nice wood stove for heat. Wood is provided cut and split at a nearby wood shed. Each cabin provides parking for two vehicles. No campers, trailers or tents are allowed in the cabin areas. Two sets of outhouses (pit toilets) are centralized in the cabin area. There is a water spigot outside of each cabin with potable water. There is no inside running water or electricity.